Add vegetable oil to a medium saucepan over medium heat. Once it's hot, add peppers. 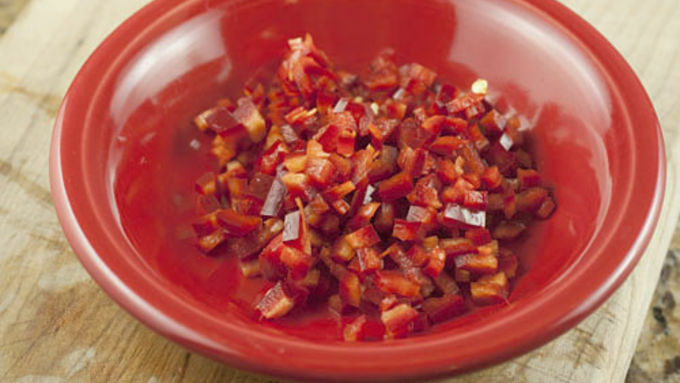 Cook diced peppers until they start to soften, about 2 minutes. 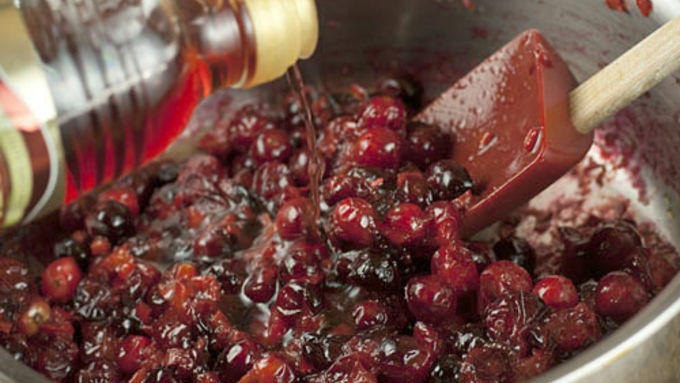 Add cranberries to pan and cook until they start to burst, about 6 minutes. Add ginger, water, sugar, orange juice, and vinegar to the pot and continue to cook down. 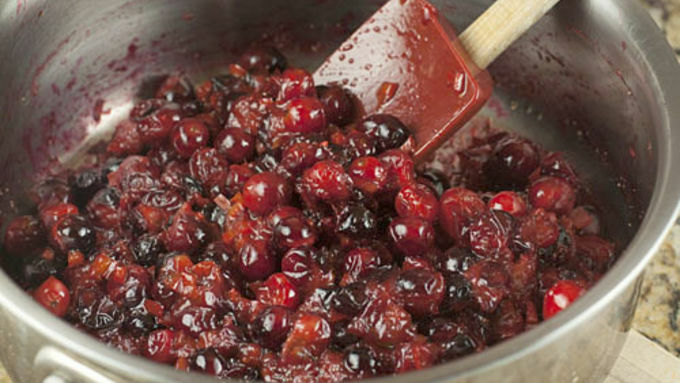 As the cranberries cook, use a small spatula or spoon to mash the cranberries a bit. Cook until the cranberries are all mashed and the mixture is very thick, about 10-15 more minutes. Serve warm or chill for a thicker sauce. I would know immediately that aliens had abducted my entire family if I showed up to Thanksgiving dinner and there wasn’t canned cranberry sauce on the table. Yep, the stuff that completely molds its shape to the can? That is a tradition in my family and it’s not even possible to leave it off the spread. That said, over the years, my family has allowed me to start experimenting with other kinds of cranberry sauce. We still have the canned stuff, of course, but I get to experiment and try new flavors. I also get a chance to serve a cranberry sauce that isn’t ribbed. My most recent experiment is a cranberry sauce that has some heat to it. I call it my caliente cranberry sauce, and while it will definitely never replace the standard stuff, it definitely deserves a chance to play with the big boys. 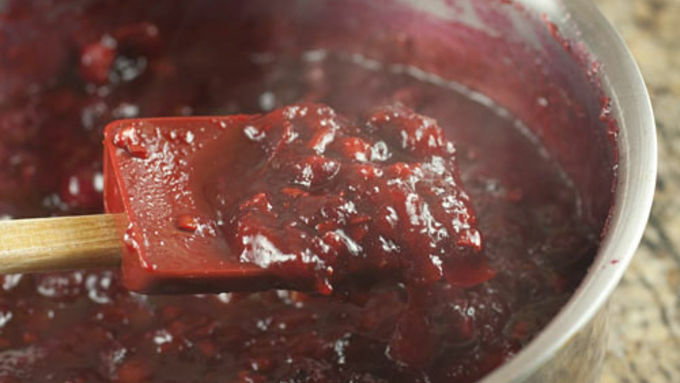 I get the impression that people think making cranberry sauce from scratch is hard. I find this fascinating, especially on a day when you’re roasting entire birds, mashing pounds of potatoes, making pan gravies, and rolling out pie crusts. Throwing a few handfuls of cranberries in a pot is probably the easiest thing you’ll have to cook on Thanksgiving. There are two kinds of heat going on in this recipe and you’ll end up with a mild heat. You could up the pepper and ginger levels if you want to, though. The red jalapenos give the sauce a classic heat and the ginger gives it this background heat that’s really nice. If you’ve never used crystallized ginger before, it’s amazing stuff. It’s great for sauces and things because it kind of melts as it cooks. You should be able to find it in the spice section at most grocery stores. When it comes to the peppers, I decided to use red just to keep the sauce a nice bright red color, but feel free to use other peppers. If you wanted to get really crazy you could dice up a habanero and toss it in. Now you can serve this sauce warm, at room temperature, or chilled. If you chill it then all of the pectin from the cranberries will gel and you’ll have a much thicker sauce. I like mine chilled, personally. 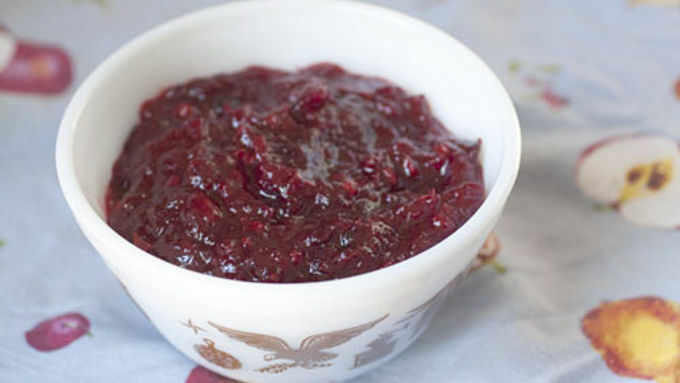 This sauce is tangy and slightly spicy and jam-packed with cranberry flavor! 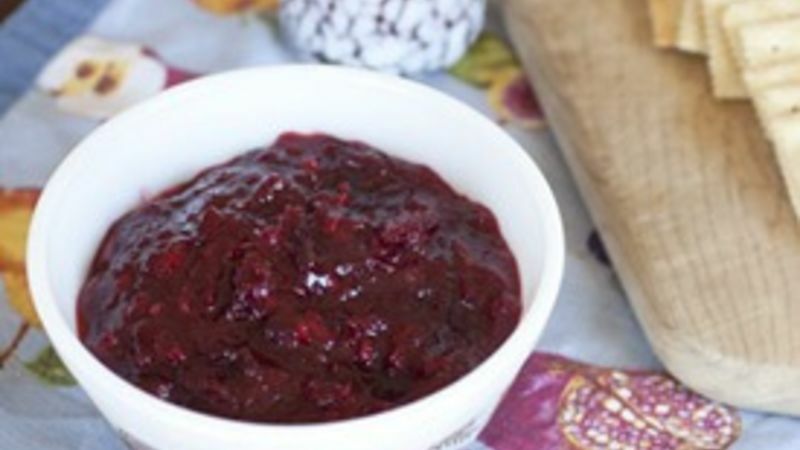 While I would never argue for substituting a traditional (canned) sauce with my family, this can be a happy addition to the table to give people an idea of what can be done with fresh cranberries.